A low pressure area descended from UAC status to MSL, and formed off the Orissa/South A.P.coast on 3rd. 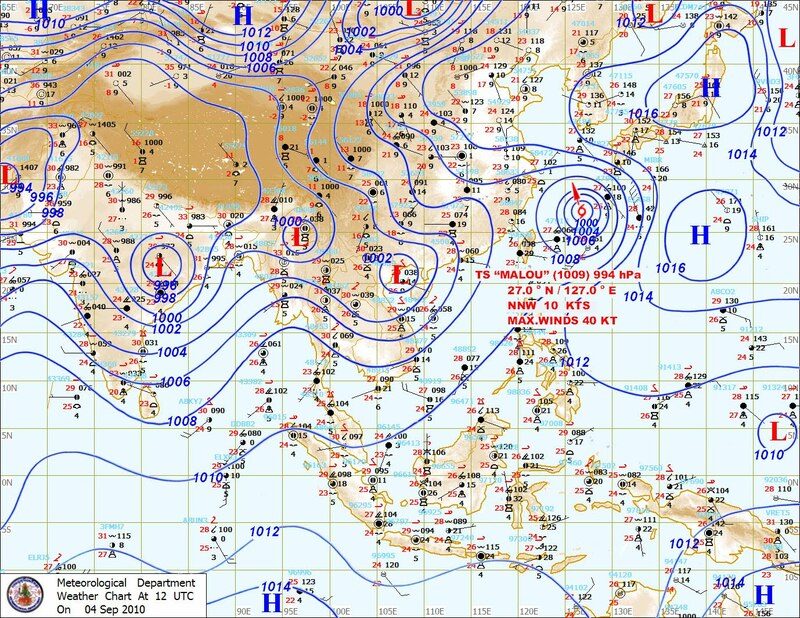 By the 4th.I see the low as having moved inland, as per the Thai Met map. At 1200 UTC, 4th.Sept, it seems to be over the Orissa/North A.P./Vidharbha region, and at 996 mb. Quite deep in such a short period of time. To that effect, we see extensive nimbo cumulus clouds over Vidharbah/NorthA.P. region. Now, the rainfall during the 4th. was quite intensive in rajasthan and adjoining Pakistan region, due to the western end of the monsoon axis. Also this end is strong and effective as an UAC has formed embedded in the axis. -western quadrant of the current system. And as a result, rains in Vidharbha and North A.P. are extensive. (see NRL map). Things moving almost in sequence with vagaries forecast. Now, I have mentioned that the system is not expected to survive much longer. I maintain the estimate of the low to fizzle out somewhere in the M.P. area by tomorrow evening itself. 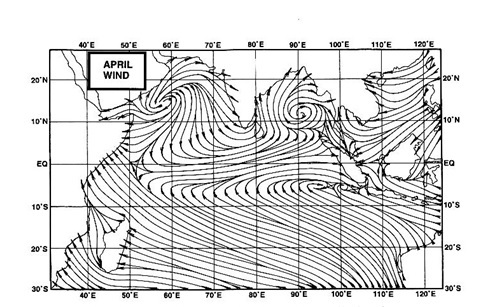 On the 6th, another sea level (land) low is expected to form in the NorthOrissa/Jharkhand region. Lasting only 24-36 hrs, this system may bring some relief rains to the region. Should move to the North-West, where it might just shift for a day, and some precipitation around. In simpler terms, heavy rainfall in interior Mah/West M.P/ Northern A.P..on 5th. Medium rains in interior Mah/Jharkhand and U.P./M.P. and Delhi on 6th/7th. Rainfall lessening substantially in South A.P./Orissa and T.N. subsequently from Sunday. Western coast will get some heavy rains, specially in Karnataka/Konkan and south Gujarat coasts on Sunday 5th/6th. due to off shore trough actvating a bit (with a vortex). 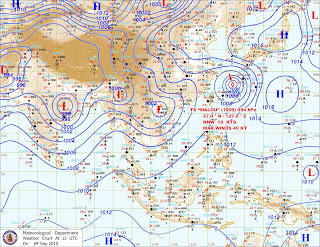 Monsoon low in the west at 996 mb still firm snd rain bearing. 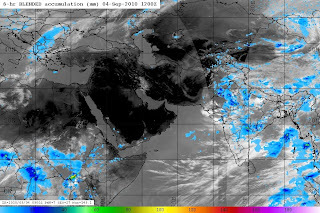 Rains in the western mosst region of India and adjoining Pakistan to last another 2 days, before the low "gives in". Mumbai: Some enhanced rainfall on Sunday/Monday.2 days of more frequent heavy showers, but not continuous.Rainfall should measure 30 mms on Sunday, and 20-25 mms on Monday. Rainfall decreasing from Monday evening. Seeing some changes in the 200 hpa jet streams in the North. Indicator of monsoon widhrawal from the northern most areas ? Vagaries will elaborate this next time, as we observe the changes, if any.